The first look of Yash Raj Film's Kill Dil is out, and its lead star tweeted it (left). 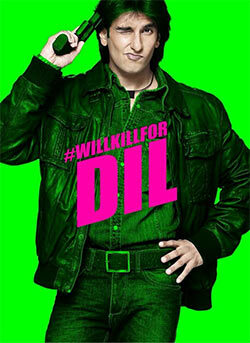 'Kill / Dil 's first look !!!!!! Waaanw waanw waaaaannnnw,' he added. The film also stars Parineeti Chopra and Ali Zafar. Cat fight between Priyanka, Anushka? Priyanka Chopra recently caught up with her Dil Dhadakne Do co-star Anushka Sharma, and tweeted a picture of their 'cat fight'. 'The PeeCee n Nushki "CATFIGHT" !! ..For those who believe everything!! #GetOverIt.' she wrote. Veteran singer Asha Bhosle is currently in Kolkata to launch her Bengali album. The promo of the third season of Aamir Khan's talk show Satyamev Jayate is out. Actresses like Deepika Padukone, Parineeti Chopra, and Kangna Ranaut will feature on the show. Ajay Devgn has started shooting for the next schedule of his upcoming Action Jackson in Austria. 'Off to Austria for last few days of shooting #ActionJackson, will try to post a lot of pics this time,' he said. Directed by Prabhu Dheva, the film also stars Sonakshi Sinha, Yami Gautam, Manasvi Mamgai and Kunaal Roy Kapur. Kunal, who directed movies like Fanaa and Hum Tum, will make his acting debut in a film titled Phir Se. He will direct the film as well. The first look of Remo D'Souza's ABCD 2 is out and its lead actress Shraddha Kapoor shared it on Twitter. The film also stars Varun Dhawan. The Big B asked his fans to come forward and contribute to the relief work in Jammu and Kashmir. 'As we sit in the relative comfort of our homes, a thought for those in Kashmir that suffer .. do come forward and help ! We are all contributing through many agencies privately to get provisions for those that suffer in Kashmir ..DO CONTRIBUTE AND HELP. A very loved and beautiful part of our body is in trouble - Kashmir - we must provide for our brothers and sisters ..CONTRIBUTE !!' Bachchan wrote. Sunny Leone is obviously feeling very determined. 'Workout time!! I just feel like doing nothing today but going to have to push through it. Blah!!!' she tweeted.